More women than ever—237—were on the ballot in the 2018 midterm elections, candidates representing both major political parties. Experts called it a historic election for women, with at least 123 joining the U.S Congress. State and local elections also saw an uptick in women winning a seat, including Melissa Shusterman ’89. The Phoenixville, Pa., resident will serve District 157 in the state House of Representatives. As a student at Lafayette studying Russian & East European studies and Chinese literature, Shusterman didn’t have aspirations to work in politics. Fresh out of college, she entered the television and film industry, working for major media outlets, including MTV, VH1, Home and Garden, and Food Network. In 2010, she started her own digital media firm, Fedora Media. Eight years and a turning-point election later, a lot has changed for Shusterman. We talked while she packed up her campaign headquarters in preparation to move her office to Harrisburg in January. Like many of the women who ran for office this year, you don’t have a background in politics. What made you decide this was what you wanted to do? I’ve always been supportive of the Democratic candidates in my area, and in 2017, I worked with the candidates by canvassing with them, holding enrichment events in my home, and offering my time. All of the local Democratic candidates in my district won, showing hard work can pay off. In the 2016 presidential election, my 16-year-old son had an internship with the Clinton campaign. 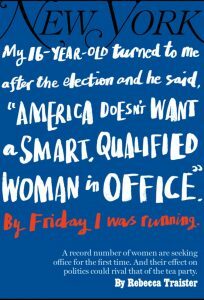 After the election, he said to me, “America doesn’t want a smart, qualified woman in office.” By Friday, I knew I was running for office. What he said appeared on the cover of New York Magazine in January of this year (see below). Often, men and women spend time complaining about politicians but feel like they have no ability to make a change. The best way for women to make a change in our future is to be on the inside of the political structure. As for not having a political background, that means I’m not coming from somewhere where I owe certain interest groups certain answers or votes. My message of common sense before politics is completely literal. We’re in a time when people are voting with their parties, against what would move Pennsylvania forward. Maybe that’s because they’re receiving large donations from an interest group like oil or gas, or because they’re looking to climb the ladder. But we need to bring a little empathy and common sense back to the role of politics. Across the country, we’re sending our representatives and senators to Washington, and in my case, Harrisburg, and hope that they will use their common sense and empathy. But what we’ve been seeing is all sorts of political tricks, and we’ve lost touch with the potential of this country and this state. “Common sense before politics” is pretty straightforward, but it really resonated with people when we canvassed neighborhoods. 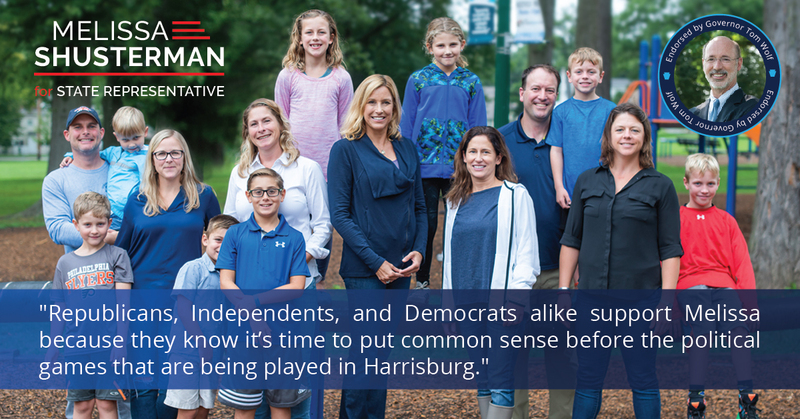 Now that you’re heading to Harrisburg, what message do you want to convey to people, especially women, in Pennsylvania and around the country? We have a lot more work to do. We need to continue to increase women’s presence, and they need to continue to run, which I think they will. And once we’re inside, we need to create change. Was there a particular moment when you realized you could win the election? There were glimmers of victory in the primary election. And we started to see our hard work pay off when people recognized us from knocking on doors. There was a huge turnout on Election Day, but you can’t take that for granted. I ran what I call a purple campaign. Some of the first volunteers who came to my office are Republicans. But I want to serve my district. I want to be a public servant, not be someone who just sits in office for 30 years. We attracted people from all over: young people who had never voted, old people who had never voted, Republicans, people from the Green Party. After you graduated from Lafayette you went on to work in film and start your own media company. How will your film background help you in your political career? On the campaign trail, I heard a lot of people’s stories. Not Democratic Party stories, but people’s stories. I’m in an industry in which I create stories, and one of the best parts of running for office was to hear personal stories. As someone who works on a project basis, I can see exactly what the end result will look like when I’m still at the beginning. I absorb a lot of different points of view to get to that end result. I work under extreme pressure and against tight deadlines. I’m used to hearing all sorts of opinions, and even if I don’t necessarily start out agreeing with them, I learn how to compromise. You recently worked with Lafayette’s Gateway Career Center to speak to students about emerging digital careers, and you spoke at the 2016 Council of Lafayette Women Conference. What words of wisdom do you have for young people? Be nimble. There are opportunities all around you. I never thought I’d run for office. I like what I do, in film. I’m good at it. But this was something I felt I had to do as an American. I was never in the military, so this is my way to serve my state and my district. How has your Lafayette education helped you grow as a person and professional, and now, as a politician? I was able to have so many different experiences while at Lafayette. I rowed crew. I went to Russia. I went to Oxford during my senior year. I worked in a lot of different environments, which gave me confidence to move into film and TV, and now, politics. Your two-year term starts in January. Have you thought about re-election? Absolutely. There will still be work to be done. Congratulations on winning your place in Pennsylvania and American leadership. Most politicians seem to have forgotten they were elected to serve as our voice, and I’m confident your Lafayette experience will help you share our college’s values in all that you strive for. Chris (Hanson) Kaufman ‘72. Delighted to see a Lafayette virtue, common sense, being moved center stage. The fringes, right and left, are like arms around a globe: they end up at the same place. Politically most noise is generated by the extremes and, unfortunately, the media are attracted by noise. I gave up on the states after military service in Vietnam but I still believe most Americans and the rest of the free world want the center and common sense, even if uncomfortable, solutions for the good of ALL. It should be noted that her father, Richard Shusterman, is a Lafayette classmate of mine. Melissa comes from good stock! In 1920, women in American got the vote. Almost 100 years later and they are flooding Congress, state and local offices. Bravo! As a fellow Lafayette alum I wish Melissa best of luck. I live in District 87 represented by Greg Rothman (R). Even though our politics are much different, I’m just across the river from HBG and hope you could join the Central PA alumni club for an event in the future. I wish you and the other newer members of our state legislature luck to re-establish a bi-partisan approach to tackling our State’s challenges. Guaranteed-benefit pensions enjoyed by state and school board employees is a significant challenge ahead and not specifically mentioned on your web site. Strong public education and municipal services will not be jeopardized with all new hires going into the 401K route as do the majority of private businesses today. I am refreshed to see a new member of the state legislature who is not an attorney and has worked in private industry. Once again, best of luck.